The founder of the "Sonata" Warsaw Children's Orchestra (1984 – 1988). 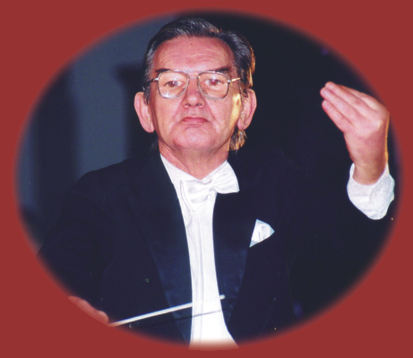 Conductor and arranger of the entire repertoire of the Orchestra, pedagogue, veteran of the Warsaw Uprising. 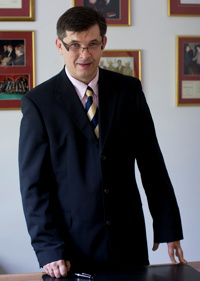 Co-founder (along with Jacek Łepecki) of the "Sonata" Warsaw Symphony Orchestra (1991 – 2001). A man of great authority for generations of Poles. Once he has completed his professional career and retired as an artist, Bogumił Łepecki has received a proposal from the Minister of Culture of the Republic of Poland, who asked him if he could make the wealth of knowledge he possessed available to young Poles. In 1988, the Orchestra received the "Golden Fir" – the first prize on the International School-age Youth Culture Festival in the Oskar Kolberg Philharmonic in Kielce, despite fierce competition from other orchestras from both Poland and other European countries. In the years 1989 – 1991, under his artistic direction, the Orchestra toured France, Belgium and Sweden, with a total of nearly 70 live performances, including a concert at the Basilica of St. Pius X in Lourdes, attended by 25 thousand pilgrims from all over the world, or at the L'église Sainte-Marie-Madeleine in Paris. After that the Orchestra has attracted considerable interest during its performances in Warsaw, in the Mazowieckie Province and across the whole of Poland, resulting in an invitation by Ms. Maria Fołtyn for the 29th International Stanisław Moniuszko Festival, where it appeared amongst the most eminent Polish artists. In 1991, Bogumił Łepecki and his son, Jacek Łepecki, reformed the Orchestra into a small symphonic ensemble, which has toured Germany three times in the years 1991—1993, gaining considerable acclaim, as evidenced by the rapturous reviews in the German press. At that time the first violinist of the Orchestra was Mariusz Patyra, the most gifted young Polish violin player of young generation and the only Pole in history who has managed to win the Niccolo Paganini Violin Competition in Genoa. In the period between 1993 and 2000, the "Sonata" Symphonic Orchestra received many requests to play during official celebrations, including those with an international dimension, resulting in another international tour in 1994 – this time the destination was Israel. The Orchestra also invited the Israeli Youth Orchestra of the City of Lod to play a joint concert in Warsaw; other orchestras to be invited to perform live in Poland were the Bonn Youth Symphony Orchestra from Germany and the Swedish Youth Symphony Orchestra from Ostersund. A number of events have occurred in the history of the Orchestra which held a particular significance, including the Special Symphonic Concert during the official celebrations of the 50th anniversary of the Warsaw Ghetto Uprising (1993) at the Church of All Saints in Warsaw as well as the Special Symphonic Concert on the main day of celebrations marking the 50th anniversary of the Warsaw Uprising (1994) at the Grand Theatre – National Opera. W 1995 roku Bogumił Łepecki zostaje odznaczony przez Prezydenta RP – Lecha Wałęsę za walkę o suwerenność i niepodległość RP – Krzyżem Kawalerskimi Orderu Odrodzenia Polski. W 1996 roku zostaję uhonorowany przez Prezydenta m. st. Warszawa Marcina Święcickiego – Prestiżowym Medalem m .st .Warszawa – Czterechsetlecia Stołeczności Warszawy. In 1995, Bogumił Łepecki was awarded the Knight's Cross of Polonia Restituta by the President of the Republic of Poland, Lech Wałęsa, for the struggle for the independence and sovereignty of Poland. A year later he received a prestigious medal commemorating four hundred years of Warsaw as the capital city of the Republic of Poland, awarded by the President of the Capital City of Warsaw, Mr. Marcin Święcicki. In 1998, Bogumił Łepecki received the Medal of the Mazowieckie Province from the Warsaw Province Governor. In years 1995 – 2001, the Orchestra went through a period of reorganization both in terms of its structure and artistic character, playing many independent concerts, both in Poland and all across Europe, including Lithuania (1997) and the United Kingdom (1998) under the successful direction of Bogumił Łepecki. He directed the "Sonata" Warsaw Symphony Orchestra a few hundred times in its history, including live performances during official celebrations (many of which had an international dimension). During that time the Orchestra had the honour to perform under the auspices of the Polish Prime Ministers, the Marshals of the Polish Sejm, the Primate of Poland, the Papal Legate in Poland, Field Bishops of the Polish Armed Forces, Polish Bishops and Archbishops of the Roman Catholic Church as well as the Ambassador of the State of Israel. On December 21, 2001, having dedicated 17 years of his life to the "Sonata" Warsaw Symphony Orchestra and the entirety of this life – to National Culture, he passed away, leaving behind a resplendent body of artistic works, remembered with great reverence by those who knew him. The Field Cathedral of the Polish Army in Warsaw – the Church of Our Lady Queen of the Polish Crown Honour guard detail of Polish Army soldiers for the burial of Bogumił Łepecki at the Field Cathedral of the Polish Army in Warsaw, December 23, 2001. Farewell ceremony for the late Bogumił Łepecki held on the courtyard of the Powązki Military Cemetery in Warsaw.